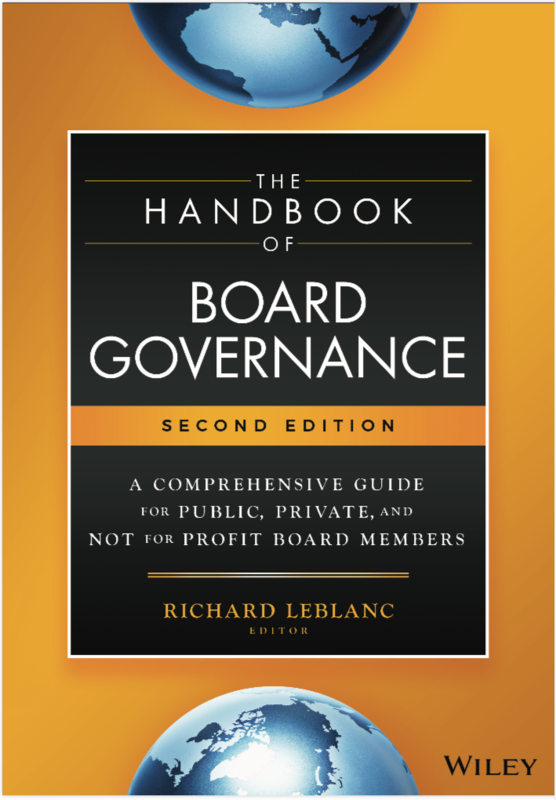 The Handbook of Board Governance Second Edition forthcoming 2019-2020! Posted in Audit Committee, Ethical Leadership, Citizenship and Integrity, Global Corporate Governance, Risk Governance and Combined Assurance | Comments Off on Regulators turning up anti-bribery heat on corporate boards: But will practices change? A global “mega-cap” company recently asked me to submit a briefing on how a boardroom of the future will look. This is an abridged summary of my report. Your shareholders will nominate and elect your directors by electronic voting directly on your website. They will base their vote on the accomplishments of each director and track record of acting in the best interests of shareholders and the company overall. Electronic registries and meetings will be the primary basis upon which shareholders select directors to your board. Director competencies will be fully disclosed. Your board will be 40% to 50% women and have far fewer CEOs on it in the next five to seven years. 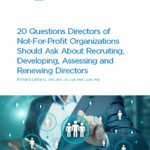 Your directors will be independent experts within their relevant strategic domains, will be quick studies, and will have access to the best learning of the company. They will request an Office of the Board be established. Board tenure will not exceed 9 years. Reporting to shareholders will be fully integrated and online. Non-financial risks and internal controls will be independently assured. All reporting will be accessible, complete, accurate and independently validated. Your board will be paperless and directors will have access to any piece of information they need to oversee and advise management. Technology will be used to attract and communicate with international directors. Risk appetite frameworks, established by the board, will translate into clear incentives and constraints using integrated firm-wide information systems. Executive compensation will be established by shareholder-directors. Professional standards will be imposed on any consultants retained by these directors. All compensation will be fully risk-adjusted and linked to performance. Current models and methods will change significantly. An Office of the Board will be established. It will house independent staff and resources available and accountable to the board and paid by the company. The unprecedented intrusion into the governance of companies will continue until most or all of the above reforms are implemented. The above changes are significant and will fundamentally change the way directors are selected and how boards control management. China and India collectively represent a market of 2.5 billion people with GDP growth rates hovering around 9%. Clearly they are lucrative markets for Anglo-American companies. These countries are, however, two of the most corrupt nations in the world, ranking 78th and 87th, respectively, according to Transparency International’s corruption index. Canada, the UK and US rank 6th, 20th and 22nd. If Chinese and Indian companies seek access to public money from western capital markets, to integrate more fully within the global economy, they must reform their corporate governance and accounting practices. It is not enough to rationalize Chinese and Indian companies at present as “investor risks.” Market regulators, representing the public interest whose mandate it is to protect investors, have an obligation to require compliance with listing standards and act when this is not the case. Boards of directors of companies listed on Canadian, American and British stock exchanges have an obligation to be independent and effective. Directors should be judicious when accepting directorships of Indian and Chinese companies, as they could very easily become ensnared in alleged violations of the Corruption of Foreign Public Officials Act, the Foreign Corrupt Practices Act, or the new UK Bribery Act. The Ontario Securities Commission recently ordered senior executives of Sino-Forest Corp. to resign. Subsequently, the Chair and CEO of Sino Forest resigned amid an internal review of fraud allegations. The Securities and Exchange Commission recently established a task force to address abuses by Chinese companies accessing US markets through “reverse mergers.” Twenty-five NYSE listed Chinese companies have disclosed accounting discrepancies or have seen their auditors resign, shares have been halted in more than twenty Chinese companies, and five Chinese companies have been delisted. The Satyam case in India represents a high-water mark for fraud and defective corporate governance in India. We will see how the alleged fraud at Sino Forest and several other Chinese companies play out. In Sino Forest’s case, independent investor-led research firm Muddy Waters has accused the company of “massively exaggerating its assets,” of having “a convoluted structure whereby it runs most of its revenues through ‘authorized intermediaries,’” and of having capital-raising tantamount to a “multi-billion dollar ponzi scheme,” with “substantial theft,” in the firm’s words. Many Chinese and Indian companies have a small number of significant shareholders, typically company shareholders or management. In China’s case, “Guanxi” is prevalent, which means personalized networks of influence, or entrenched conflicts of interest and opaqueness, with law on the books but not enforced. The importance of an independent and effective board of directors cannot be overstated. The company must be audited by a licensed and properly qualified and staffed accounting firm that includes Anglo-American trained accountants who speak Mandarin (for Chinese companies). The accounting firm itself should be independently and annually assessed and have no adverse examinations. All quality assurance recommendations should be implemented by the accounting firm, including coordinated assurance cooperation by audit stakeholders such as vendors, banks, government entities, and other creditors, suppliers and customers. The company must comply with all corporate governance standards and there must be independent (e.g., Anglo-American) assurance of this compliance. The CFO and finance department of the company must be properly qualified and trained, have the necessary authority, and work at the headquarters of the company. The CFO must report directly to, and be assessed by, the Audit Committee. An internal audit function must exist, and this function must report directly to the Audit Committee at every meeting. The Audit Committee must approve the work-plan, qualifications, selection and compensation of the head of internal audit. The board of directors must have a majority of directors who are independent of management and the significant shareholder, if one exists. Half of the independent directors should have industry experience, including in China or India. Independent directors must have the authority to replace the CEO if necessary, even if resisted by the significant shareholder, particularly if the CEO is the significant shareholder. Independent directors should have authority to approve all related party transactions. Related parties should not vote and not be in the room when the transaction is discussed. The code of conduct should be written in Mandarin and all employees and key suppliers should sign off annually. Compliance should be independently assured and reported directly to the Audit Committee. Follow up directives from the Audit Committee must be implemented. The Audit Committee must have access to resources and advisors to fulfill its obligations. A proper whistle-blowing procedure should also exist, with external reporting to, and clarification provided by, an independent service provider. Director insurance and indemnification must be externally reviewed and adequate so the independent director is protected. Provisions to fund special committees and independent advisors should be provided, under the control of independent directors. Independent directors must have the authority to require external assurance for any material business risk and/or internal controls, including corruption risk. The chair of the board must be an independent director with leadership and industry experience sitting on listed Anglo-American company boards. The chair of the Audit Committee must be an independent financial expert with experience sitting on listed Anglo-American company audit committees. The Board must meet at least once a year in China (or India). Independent directors should meet with local management and personnel without senior management present. All recommendations must be acted upon and with a progress report provided to independent directors. Boards of directors of companies traded on western stock exchanges must oversee effective internal controls over corruption, financial reporting and reputation risk. The above points are a starting position and minimum thresholds to protect an independent director and afford necessary authority to fulfill his or her obligations.